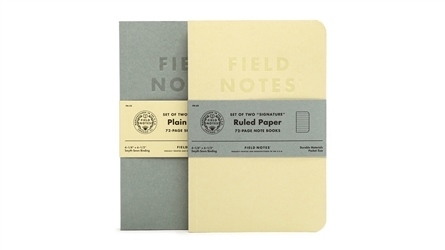 Note: This is for the lined sketch notebooks with cream covers. Following the popularity of Fall 2017 limited edition release, Dime Novel, Field Notes released a new regular edition set of "Signature Series" books. This two pack of notebooks measures 4.25" x 6.5" with 1/4" lined interiors and the classic 3/8" rounded corners, but instead of the typical 48 staple-bound pages, this edition features Smyth-Sewn binding of three Strathmore Premium Wove "Ultimate White" 70#T 24-page registers totaling 72 pages.